Space S.r.l. is strongly committed in the design and construction of green sand cooling and preparation plants. The Company was established in 1979, by a team of engineers formerly serving in a well reputated Company having history in Foundry Industry. In the last years, the relevant success obtained in the European Market as well as in the Eastern Countries, proved the technological high level. Very important Foundries, operating within the Automotive Industry, considered as one of the most exigent for the quality and the reliability of equipments, are in Customers list. The products restless innovation is incited from the specific needs and suggestions of Foundry men, with whom a permanent cooperation relationship is maintained instead of a bare “Supplier-Customer” relation. A very qualified team provide to develop projects according to the specific individual requirements. After-sale service is available round the clock directly from the Company headquarters. 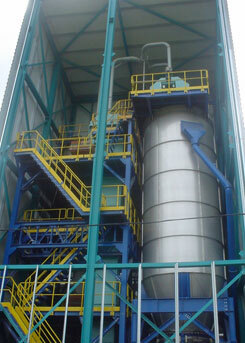 Complete green sand preparation plants. Return sand reconditioning and cooling plants. Rotating pan intensive mixers. Twin horizontal shaft continuous premixers. Rotary screens. Belt conveyors. Vibrating conveyors. Bucket elevators. Bottom bin activator. Return and moulding sand aerator and lump breaker. Pneumatic transport system. Equipment for automatic control and adjustment of moulding sand physical characteristic and for sand, addition and moisture batching. Design and production of steel structure and construction.